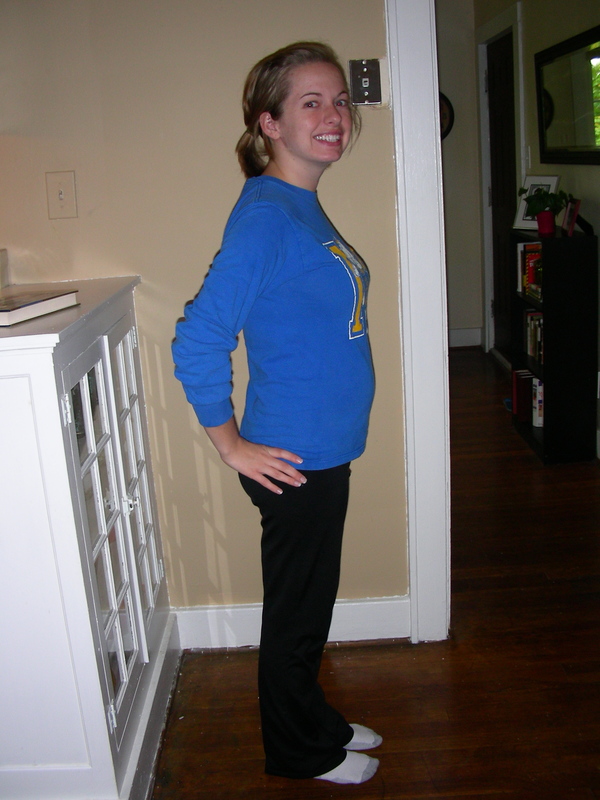 My Messy Manger: 20 Weeks Pregnant! I can't believe I am already 20 weeks pregnant... roughly halfway there (depending on when Baby Hutch decides to actually make his arrival)! I was telling hubby the other day that it seems like the first trimester crawls by because you feel so sick and you know that your change of miscarriage is so much lower once you get past that 12th week. But then after that you start to really enjoy it and it just flies by! On Thursday morning, I was laying on the couch for a second and started pushing around on my belly to see if I could figure out how he was situated in there. Then out of nowhere I SAW this HUGE kick! I wasn't expecting to be able to see kicks this early! I've seen them every day since, and it is just the COOLEST thing ever! Hubby can't seem to be watching at the right to see them yet, but he still has about 20 weeks and they will only get stronger from here. I am so excited! This is so much fun! I think that maybe it is all in your head because all that I have ever seen on the outside is you breathing!!! ;) although, maybe (just maybe) I saw a little something once. I first saw the baby kick at 20 weeks too! I was on the internet looking up how he was growing and out of no where there he was! It is possible and it is the best feeling and sight ever. I just can't wait until hes here! that is great! i will be 20 weeks on sunday, but tomorrow, i am already thinking of getting an ultrasound because i am due for my prenatal. God bless your pregnancy!